I was bummed after the PR and Marketing department for Microsoft failed Family Friendly Gaming so badly. My heartache turned to joy after Family Friendly Gaming purchased Forza Motorsport 7 on the Xbox One. It is always neat to know whom you can depend on. This racing game is better than I was expecting. Too bad the PR and Marketing for Microsoft cost them so many sales. 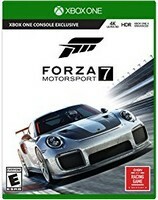 Forza Motorsport 7 would have also appeared in the Christmas Buying Guide 2017 if they had returned to professionalism and provided us a reviewable copy. Instead it should appear in the Christmas Buying Guide 2018. It will cost families less money in 2018 so in the end you will benefit from it. We keep that in mind because we care more about ya'll than some profit margin for a company. Forza Motorsport 7 takes the awesome racing mechanics from the Forza Horizon video games and puts it into the Forza Motorsport franchise. There are many more race tracks in Forza Motorsport 7 than previous iterations. Forza Motorsport 7 puts Forza Motorsport 5 and 6 to shame. The only thing missing in Forza Motorsport 7 is the open world. Expect to find a review for Forza Motorsport 7 on the Personal Computer (PC), and the Xbox One in issue #126 of the always amazing Family Friendly Gaming magazine and e-magazine. Until then know that we really enjoyed playing this game. Do you want Paul to do a video series of Forza Motorsport 7 like he did of Forza Horizon 3?